For anyone paying UK taxes, yesterday's report on the public finances from the Institute for Fiscal Studies is an alarming read. According to the IFS, unless there are some serious spending cuts, to have any hope of getting our national finances back on track by 2015-16, cash-strapped British families will each have to be paying an additional £1250 pa in tax. Added together, those factors mean government borrowing in 2015-16 will be a thumping £39bn higher (in today's money) than Brown/Darling PBR forecast. Which means that the £38bn of fiscal tightening already assumed by them will need to double. As always, either taxes will have to go up, or spending will have to be cut. 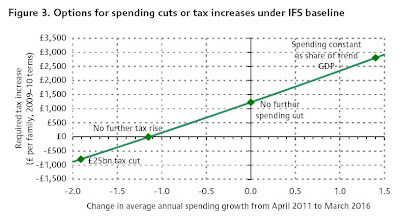 And the IFS have a handy summary chart (above) showing the grim trade-off between higher taxes (per family) and spending cuts (expressed as a percentage growth rate compared to current plans). They say that if we hold to the government's existing spending plan, taxes have to rise by £1250 pa per family. But the reality is likely to be even worse. For one thing, the IFS assumes that although GDP over the next 3 years is significantly lower than Darling assumed in the PBR, by 2014-15 it somehow gets back on the PBR track. Which means it has to grow by a cracking 4-5% pa in both 2012-13 and 2013-14. Choose to believe that if you wish, but given that the only other time it's happened was in the period 1987-88 under My Brilliant Chancellor , I'll choose to believe it when I see it. If instead we assume the recovery in GDP is a rather more plausible 2% pa, government borrowing in 2015-16 will not be £39bn higher than the PBR forecast, but somewhere around £110bn pa higher (using the standard HM Treasury rule of thumb that 1% off GDP increases borrowing by around 0.7 percentage points of GDP - the same assumption the IFS use). And to correct borrowing on that scale would require each family to pay increased taxes not of £1250 pa, but a catastrophic £3,500. The IFS projection assumes that the government is able to go on borrowing at the average interest rate assumed in the PBR forecast, which was 4.3%. But as we blogged here, 4.3% is pretty low by the standards of the last half-century. If the famous global bond vigilantes lose faith in HMG, the cost of borrowing could shoot up by several percentage points. The IFS calculates that an increase of one percentage point in the cost of borrowing pushes up the government's debt interest costs by getting on for 1% of GDP by 2015-16. Which is another £500 pa or so on that family tax bill. But there's no reason to think the increase in borrowing costs would stop at one percentage point. Last time the markets panicked in the early 90s, they increased borrowing costs by 2-3 percent. And back in the horribly similar 1970s, government borrowing costs virtually doubled. A repeat of that would increase debt interest costs in 2015-16 by around £5bn pa (£2,000 per family). Worse, until borrowing was reined back in, that additional cost would compound dramatically over subsequent years. The truth is, anyone subject to UK tax over the next decade should consider themselves stoney broke. Unless spending is cut back robustly, taxes might easily need to rise by over £3,000 per family per year.